I am really sorry. Didn’t have the time to post lately. I am never at home because of my work and the only days I am in I have to confess I prefer to spend time with my fiancé :)! But had time to serve some nice salmon tartare verrines. Verrines is definitely a must during your fancy dinners with your friends. They will love it! I will come back soon with plenty of new ideas for beautifull verrines. Dice cucumber and mix with some salt and pepper. Add one layer at the bottom of the verrines. Dice salmon. Mix with chiselled chives, salt, pepper and lemon juice. Place a layer on top of the cucumber. 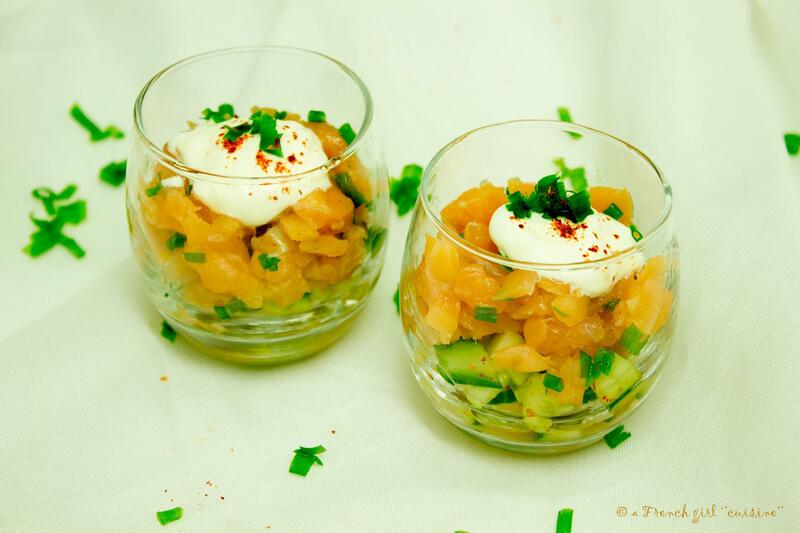 Then add one teaspoon of sour cream in each verrine, a pinch of espelette pepper and chiselled chives. Verrines are now the stars of the French tables. 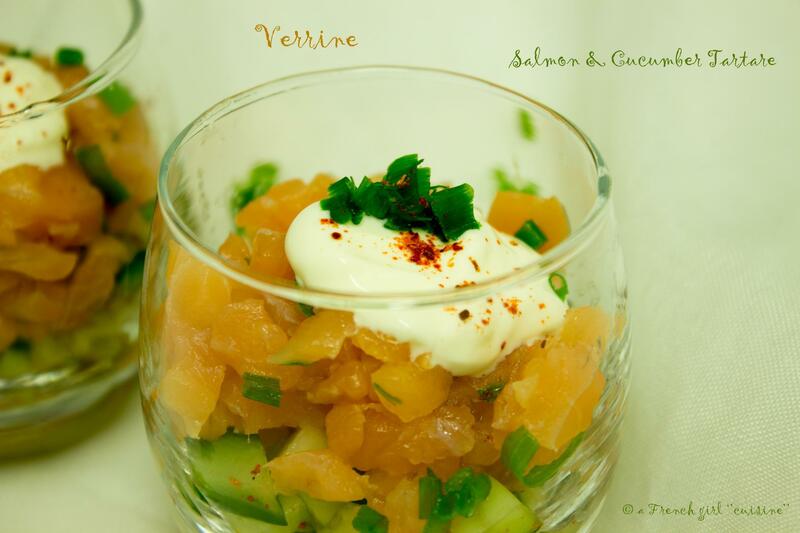 If you want to find more French verrine recipes, look at the verrine recipes index. You will discover trendy and easy to make verrines. My favourite one is the beetroot and parmesan chips verrine. I just love the colors of this one and it tastes just amazing. If you liked this recipe, share it with your friends on the social media. 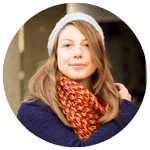 And if you want to receive the latest recipes of a French girl “cuisine” keep in mind that you can follow me on the social media or register to my newsletter. I hope that you will come back soon to make one of the recipes. Do not forget to give me feedbacks on your try! What a great way to serve the salmon. This looks delicious! Yes, I am in France right now for work. Last week was in Spain. Really nice food but difficult to find time to blog.